Targeted Phishing attacks for banking and financial domains are a popular way for attackers to steal sensitive data from customers. To counter these attacks, banks and other financial institutions are driving various campaigns to educate their customers. Recently, I found a live phishing page for the “Siam Commercial Bank” of Thailand. You can observe areas marked in the picture above, which differentiate it from the legitimate SCB website. When a victim enters a username and password, the phishing webpage sends these credentials to a webserver controlled by the attacker. Let’s enter fake credentials and see how these are sent to the cyber-criminals. Legitimate sites use SSL encryption to secure sensitive information entered by the users, while this phishing site sends the data in clear text, presumably because the attackers were too cheap to pay for a signed SSL certificate. We have observed numerous similar phishing pages. 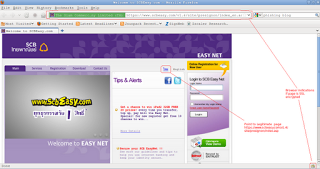 Recently, Umesh blogged about a phishing scam targeting Gmail users. It’s always a good idea to directly surf to a page before entering sensitive information, rather than clicking on a link that may take you to a fake site. I hope our blogs helps you to identify common red flags that reveal phishing pages.